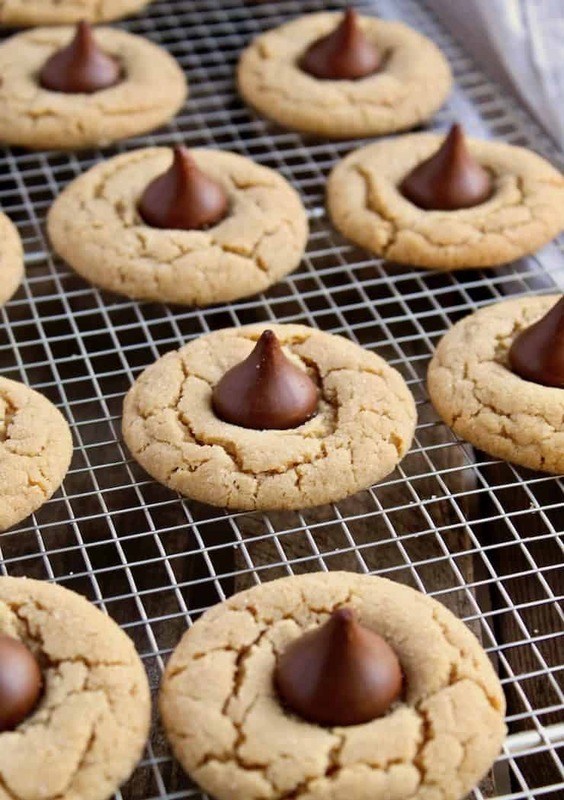 Chocolate Kiss Peanut Butter Cookies, classic peanut butter blossoms recipe ~ peanut butter cookies with a chocolate kiss baked in the center. It’s that time of year for baking cookies, and while I’m not a big baker, I have a few tricks up my sleeve ~ Kolachkes and these Chocolate Kiss Peanut Butter Cookies. Over the years, as my girls were growing up, we’d make decorated sugar cookies and gingerbread men. What a mess with all the royal icing, but so much fun for the girls. Now, I’m back to these classic cookies for my Christmas baking. As a kid growing up in the Chicago suburbs, my two besties in junior high were Linda and Laura. We were inseparable. After school, we always headed to someone’s house. 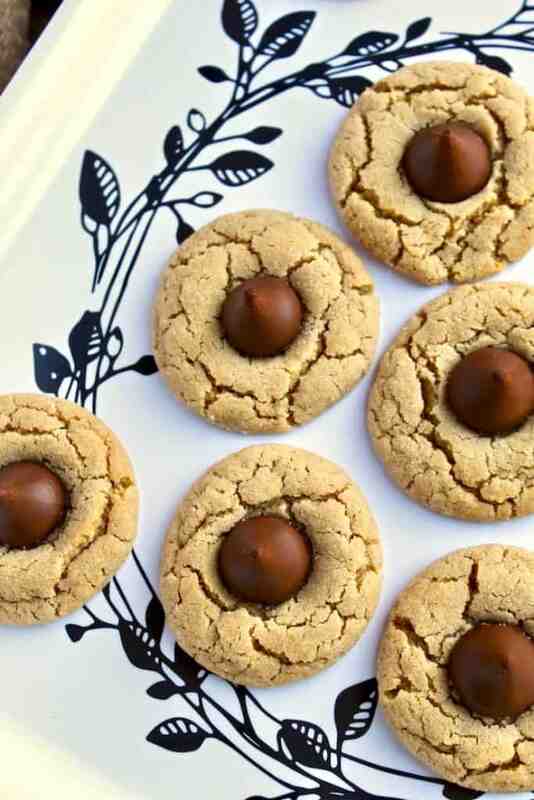 Linda’s mom usually had a home baked treat waiting for us and my favorite were her Chocolate Kiss Peanut Butter Cookies. No homemade treats at Laura’s house, yogurt or toast. 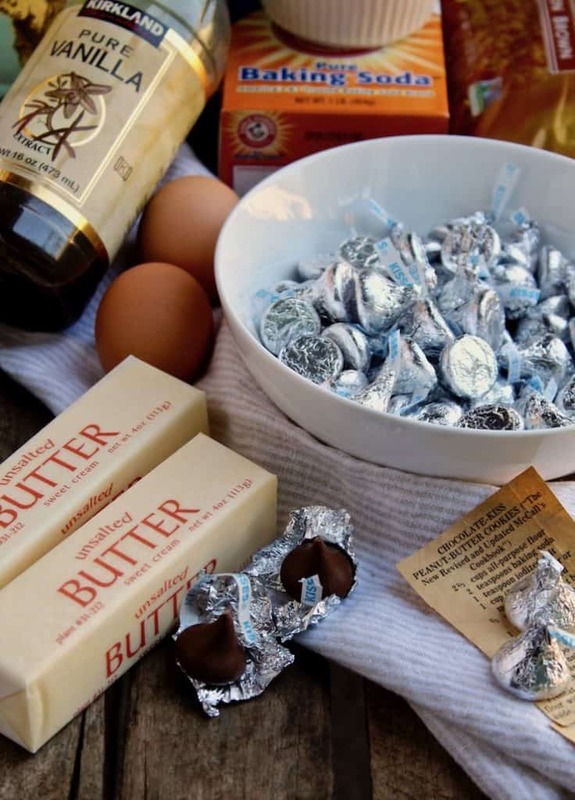 And no way would you get a homemade treat at my house ~ but you could count on Ho Hos, Ding Dongs or Suzy Q’s! Yeah, Linda’s house was the best after school. These are a classic cookie, commonly known as Peanut Butter Blossoms, although I just recently heard that term. In my 20’s, I came across a recipe for these cookies in the paper, cut it out and taped it together and I’ve been making ever since. Still have my yellowed newspaper clipping ~ the recipe was adapted from the McCall’s cookbook. I wonder if that’s where Linda’s mom got her recipe? 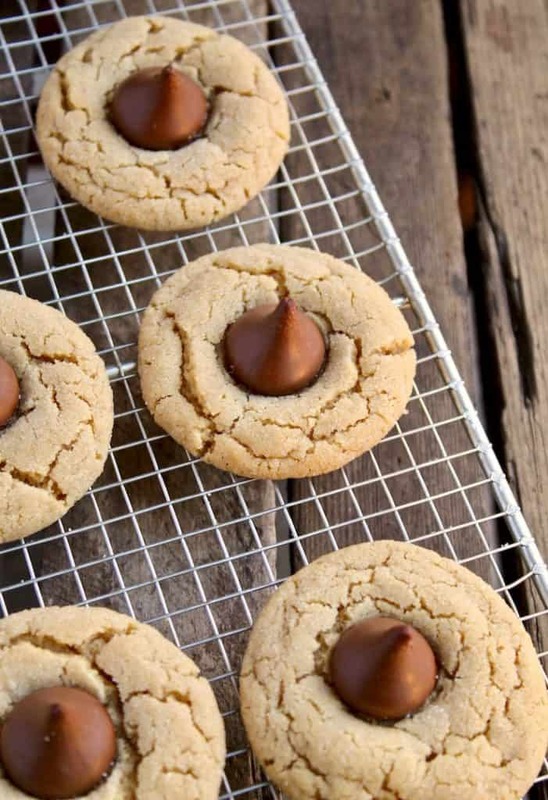 Just like the name, these are a peanut butter cookie with a chocolate kiss baked in the middle. Pretty simple, although baking is always a bit involved and cumbersome to me. You form the dough into balls, roll in sugar, bake for several minutes and then pop a kiss on top and bake a couple more minutes. After they cool, biting into one of these with the melted kiss and savory peanut butter cookie is heavenly and highly addictive. 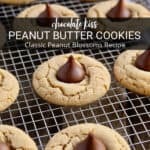 If you’ve tried these Peanut Butter Kiss Cookies or any other recipe on the blog, then don’t forget to rate the recipe and let me know how yours turned out in the comments below ~ I love hearing from you! You can also FIND ME on FACEBOOK, TWITTER, INSTAGRAM and PINTEREST. Never miss a post ~ sign up for The Hungry Bluebird Newsletter for a weekly email of new content. 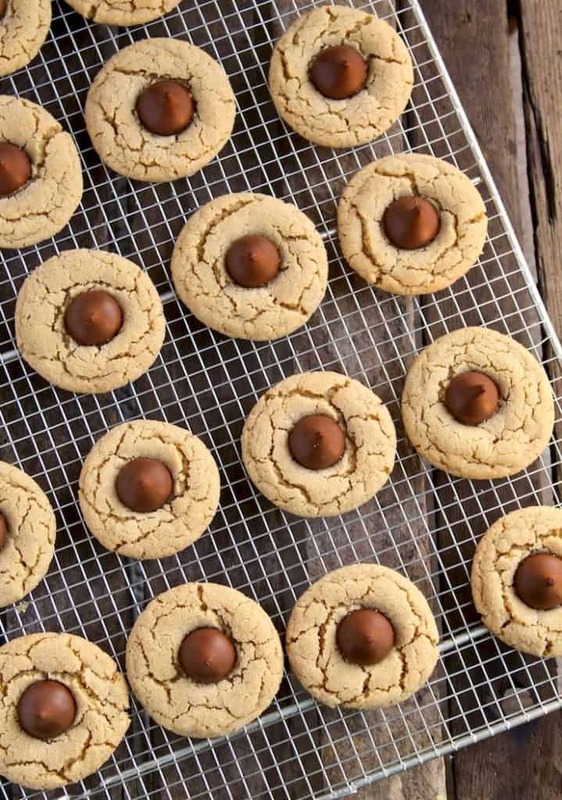 Classic peanut butter blossom recipe ~ peanut butter cookies with a chocolate kiss baked in the center. Preheat oven to 375º. Sift together flour, baking soda and salt ~ set aside. 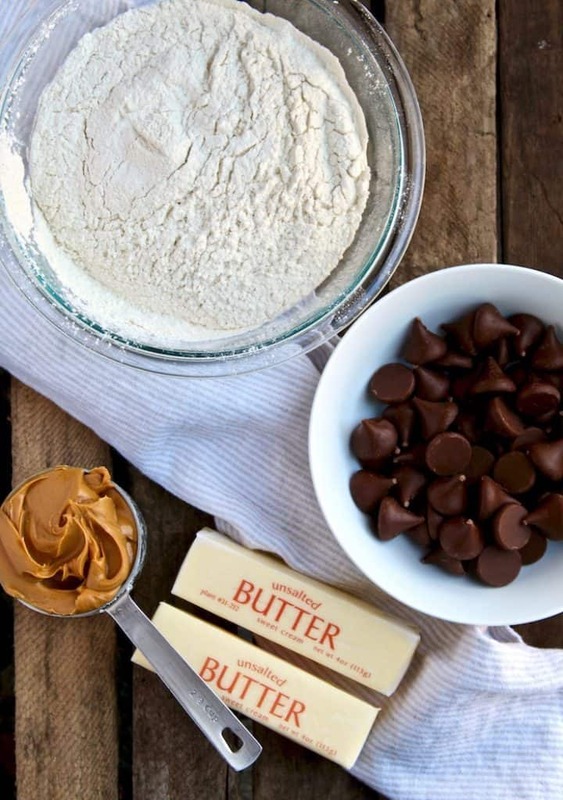 In the bowl of a stand mixer, fitted with a paddle attachment, cream butter and peanut butter until well blended. 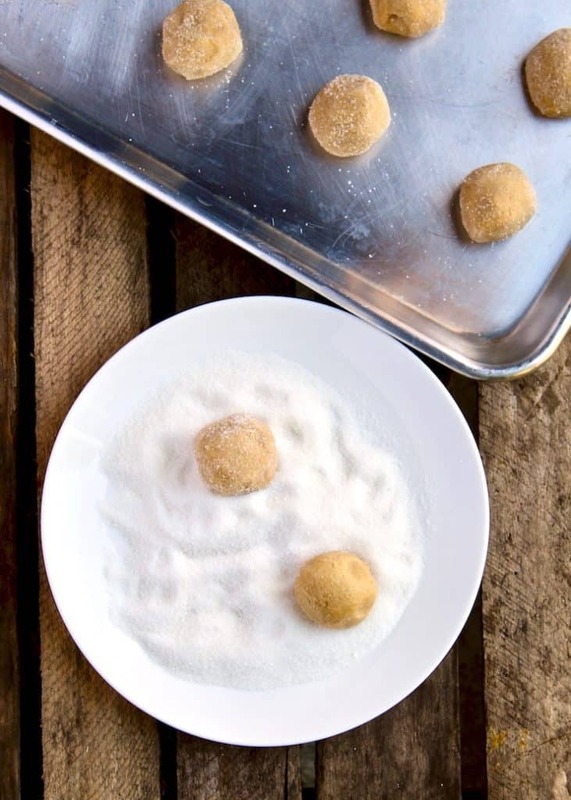 Add 1 cup each of granulated sugar and brown sugar and beat until light and fluffy. Add the eggs and vanilla and beat until smooth, scraping down with a spatula as needed. Stir in flour on low speed, a little at a time, until well combined. Mix with a spatula to make sure all the flour is combined. Let cookies cool on pan for 2 minutes and then carefully remove to wire racks to cool completely. Makes 5 dozen cookies.